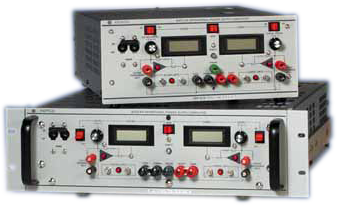 BOP-EL 1KW Bipolar power supplies similar to BOP-MG, but optimized for inductive loads/magnets. Improved temperature stability for magnet applications. Optimized for very low ripple and noise in current mode. 10V/100A MG and GL models introduced. Option L (Inductive Load) for BOP 100W, 200W, 400W Optimizes linear bipolar BOP power supplies to drive magnets up to 1 Henry. High Voltage BOP High voltage (500V or 1000V). Responds bidirectionally from zero. Offer ultra low noise and ultra low ripple at the output. Two separate control channels, for local (front panel) or remote control of the output current and the output voltage. Option C (Capacitive Load) for BOP 100W, 200W, 400W Optimizes linear bipolar BOP power supplies to drive capacitive loads up to 10 mF. Also stable with any R-C series load combination. BIT 4886 Card Allows linear 100W, 200W, 400W BOP power supply to connect communicate with PC via IEEE 488.2 bus (GPIB) or RS 232. BIT 802E Card Allows linear 100W, 200W, 400W BOP power supply to connect communicate with PC via ethernet control, either through a web page using a browser, or by using SCPI commands via Telnet.